Please choose the number of ports and amps you would like. Power distribution units such as these are not only preferred by installers, but also every day users installing their own security camera system. Please select the power box you would like to purchase from the selection list above. Here are specifications of each of the 12V Power Distribution Units you can choose above from this multi-product listing. I have TWELVE cameras with individual power adapters. How do the adapters connect to this box? Also which unit would I need? If you currently have premade security camera cabling that is terminated with a DC female connector, you would use the male DC power pigtail with this power box. The male pigtail gets screwed down in to the power terminals inside the power box. If you have 12 cameras, you will need a 18 port power box, and 12 of the male pigtails. To decide how many amps you need, determine the power consumption for each of your cameras. The 18 port 10 amps power box output 10 amps/18 = 0.55amps per port. The 20 amps power box outputs 1.11 amp per port. Do any of these boxes offer Battery Backup options? Thanks for your question. 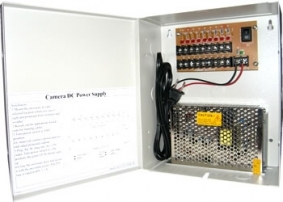 If you would like to use a battery backup for the power supply box we do carry one that you can find here. However, the run time will vary depending on the draw from the power box. Battery backups are designed to regulate voltage being delivered to devices as well as allow a short period of time to safely power down the unit in case of a power outage. Don't forget to use Peukert's Law when calculating battery time. Hi I need to replace a power supply Model w-12vdc-9p/10a do you have it available and also need one for 18 ports. On this page you can select the 18port 20amp option to select a 12V 18 port 20amp output power box. I am looking to get a 16 channel fused power supply for my dvr system. Currently I am using 15 cameras requiring a 12v power supply and 1 ptz camera requiring a 24v power supply. I assume I should go with a 12v power supply due to the majority of my cameras requiring a 12v power supply. What would you suggest to do with the ptz camera? Would I be ok running power from 2 channels of the 12v power supply to the ptz? Or should I go a different route? I appreciate your help with this situation. You cannot run a PTZ requiring 24V AC from a power box that supplies 12V DC. You can use your fixed 12V DC cameras with the power box, and use the 24V AC power supply that came with the PTZ camera to power it. It is not possible to consolidate 24V AC and 12V DC equipment in one box. Is this an outdoor power box? No it is an indoor power box.